Offer real-time rates to customers and provide shipping quotes on the product and cart pages. 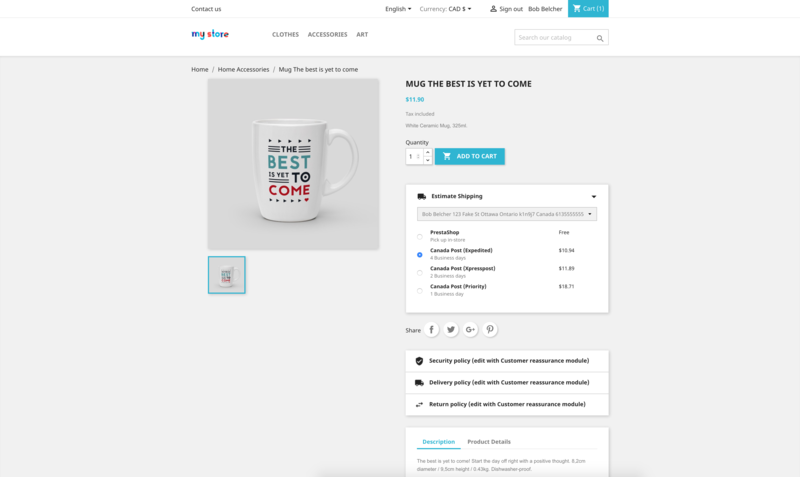 Increase conversion and reduce abandoned carts with shipping quotes on the product and cart pages without requiring the customer to make an account. Save money by avoiding overcharging/undercharging with dynamic box packing. Simply click “Sign into Canada Post” to connect your Canada Post account, add your address, and you’re ready to go. Offer real-time Canada Post rates at checkout. Your negotiated/discounted Canada Post rates will be used if available. Select the carriers you want to use and the module installs them for you in your back-office automatically. 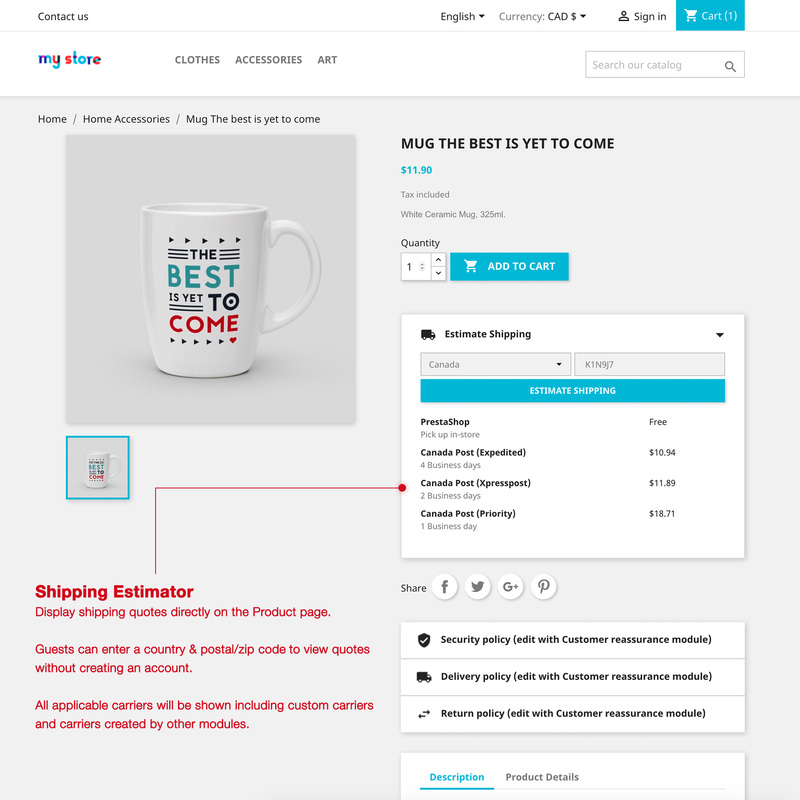 Increase conversion by displaying shipping quotes on the product & cart pages. The shipping estimator allows guests to enter a country and postal/zip code to fetch quotes without making an account. 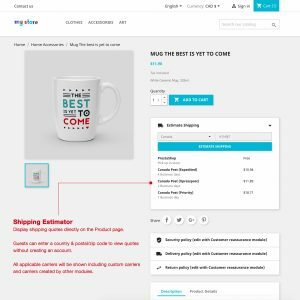 Prevent “shipping fee shock” and reduce abandoned carts by displaying the shipping costs upfront. 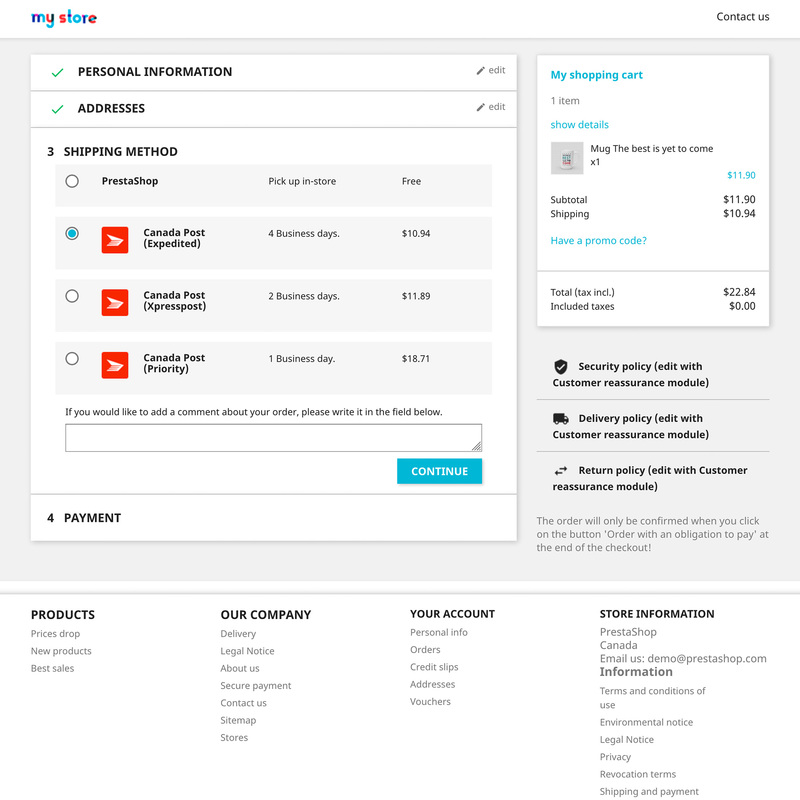 Existing customers will see rates based on their account’s shipping addresses. Customers with multiple addresses can select a different address from the estimator’s drop-down menu to see different rates. The estimator will show all applicable carriers for the cart including custom carriers and carriers added by other modules. 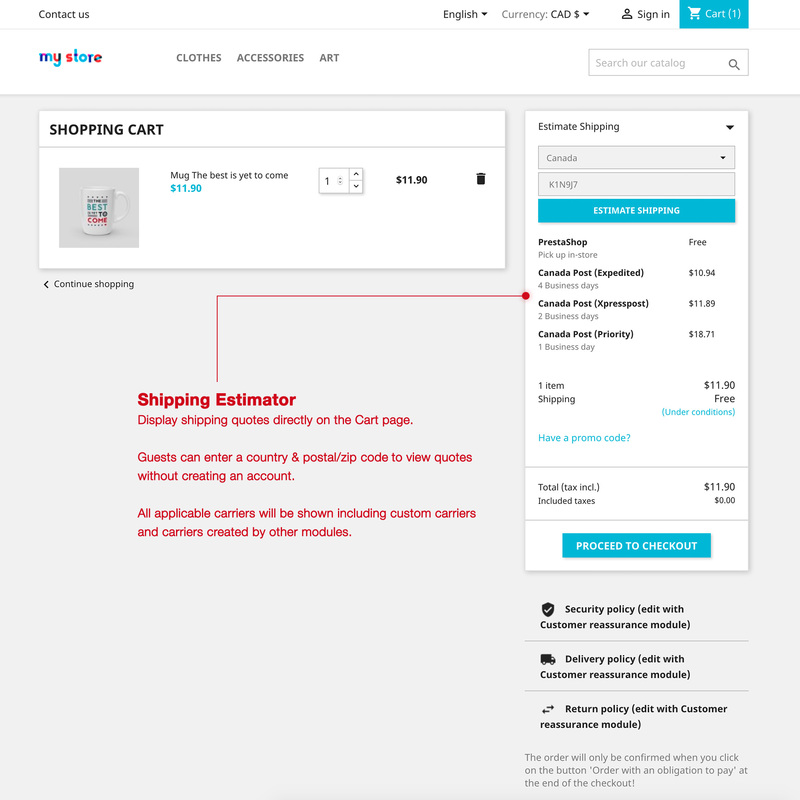 Customers that have a product added to their cart can change their cart’s selected shipping method from the estimator. 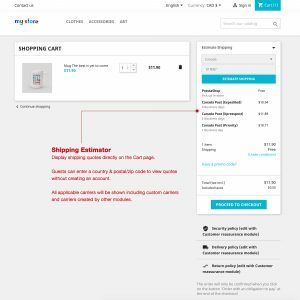 The estimator takes into account the product that the customer is currently viewing – any carrier restrictions or carrier discounts for that product will apply even if they haven’t added it to their cart yet. 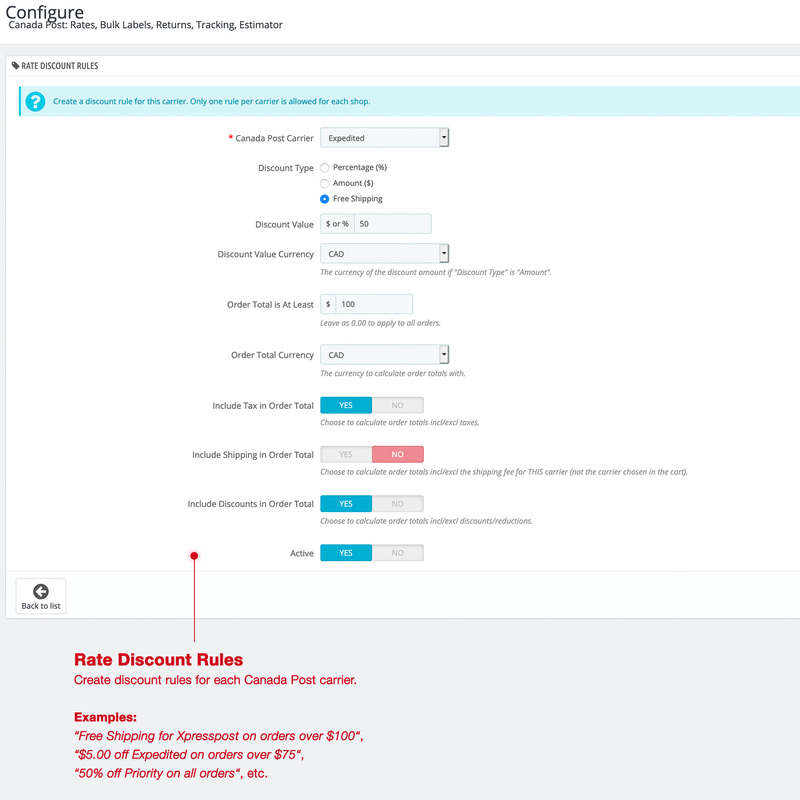 Configure custom discount rules for each carrier. Increase conversion and save money by offering accurate rates based on the products in the cart. 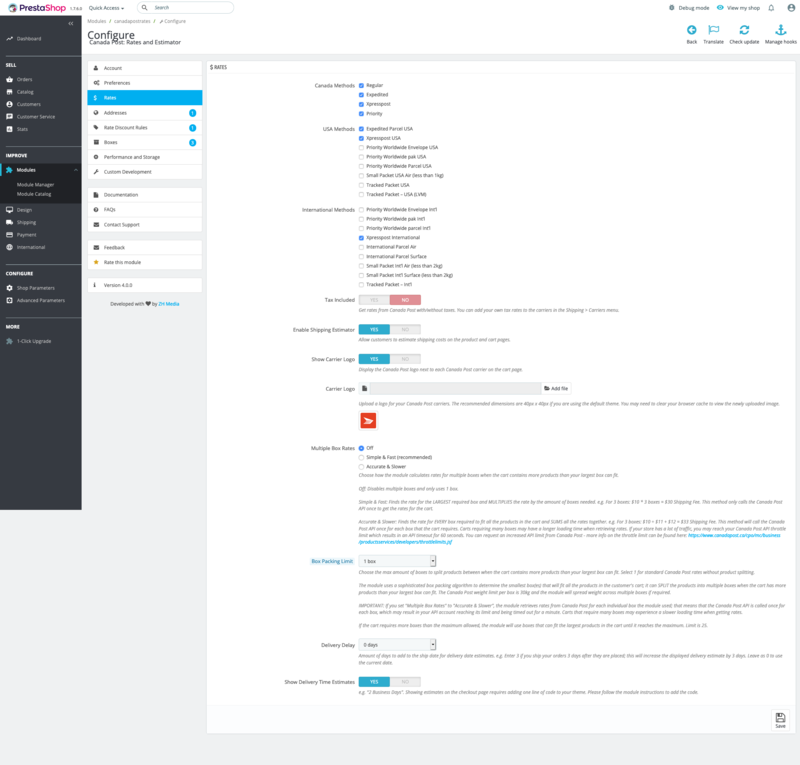 Add all the box dimensions that you ship in the module configuration page. When calculating rates, the module uses a sophisticated box packing algorithm to determine the smallest of your box(es) that will fit all the products in the customer’s cart; it can split the products into multiple boxes when the cart has more products than your largest box can fit. Choose if you want to charge customers for each box or if you only want to charge for one box. 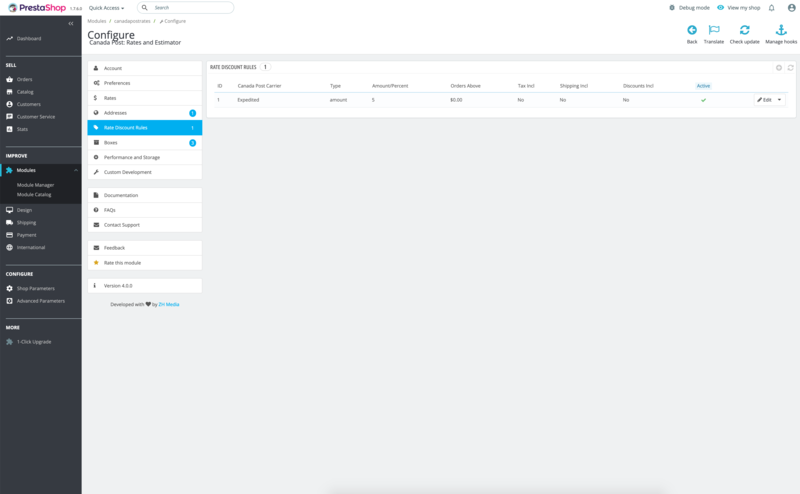 Add unlimited boxes into the module from the configuration page – the more boxes you add, the more accurate the rates will be. Avoid overcharging/undercharging customers for shipping. The module stores rates for each cart in the database to speed up your website. It will only retrieve new rates if the customer changes their zip/postal code, the products in their cart, or the quantities for products already in their cart. Go to the Modules page. Click Upload a Module and upload the module .zip file. The module must be configured with your Canada Post account, an origin address, and at least one box. Find the Canada Post module and click Configure. 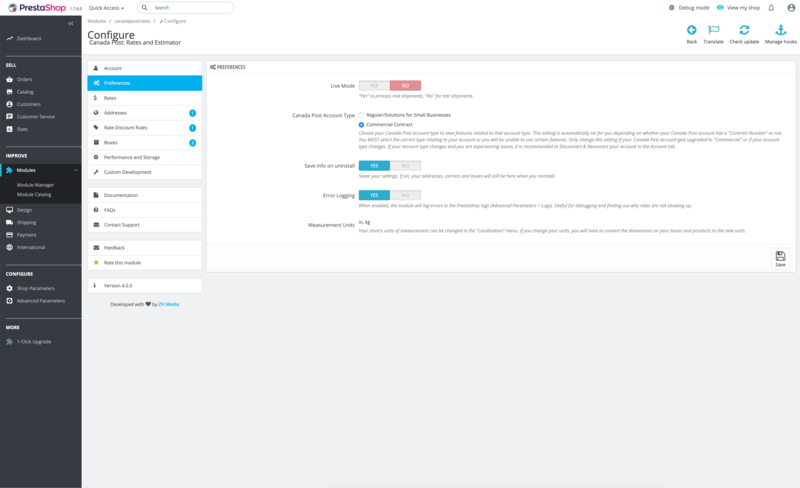 You’ll be redirected to the Canada Post website where it will prompt you to login to your account and authorize the module to create shipments on your behalf. You can revoke these permissions at any time from the Canada Post website. You must agree to this step even though this module does not use the Labels feature and will not charge your Canada Post account. 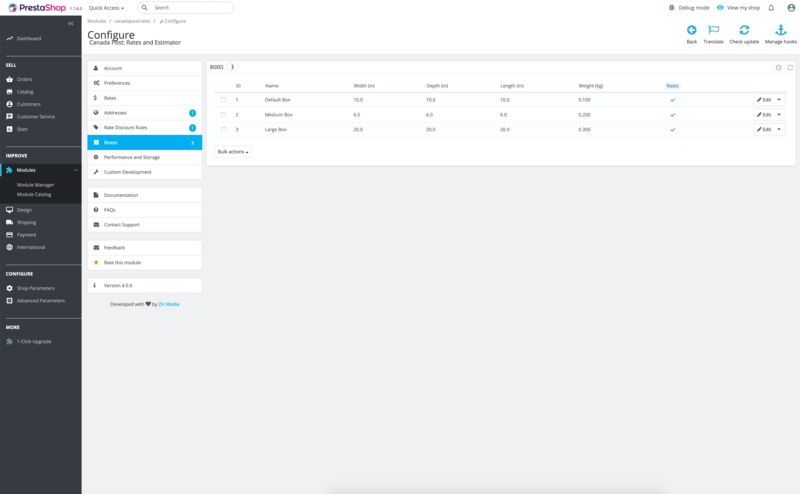 Module completely re-built from the ground up with new features and better performance. FIX Bug with creating manual orders. 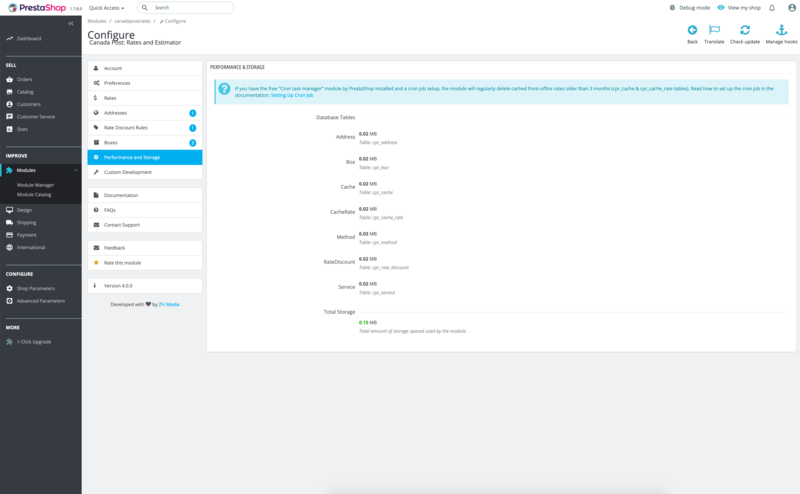 FIX Some rate services not appearing for certain addresses. FIX Bug preventing from deleting a box on some servers. NEW Added two new International shipping methods (parcel air, parcel surface). 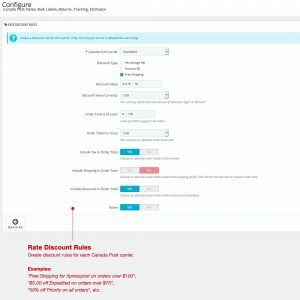 Fixed rate not updating for Shipping Estimator module. FIX: Syntax for select form fields in latest PS version on older PHP versions. This module can be found on the PrestaShop Addons store here. Add a product to your cart and view the rates. Change addresses at checkout to view rates for different locations. View the Product & Cart pages to see the Shipping Estimator. The back-office features require a Canada Post account to be connected and cannot be demoed due to security concerns. If you have any questions about the functionality, don’t hesitate to send me an email and I’ll be happy to provide more information.